State College Spikes catcher Alexis Wilson, right, holds on to the ball, but Batavia’s Brayan Hernandez, left, is called safe at the plate during Wednesday’s rain-delayed game in State College. Batavia defeated the Spikes, 5-4. UNIVERSITY PARK — If there was ever such a thing as an unearned win, Batavia may have secured that title Wednesday afternoon against State College. In its 5-4 win over the Spikes ina New York-Penn League baseball game at Medlar Field at Lubrano Park, the Muckdogs were given a few extra chances at the plate — and they cashed in. Following a 2 hour, 20 minute rain delay, the sun came out and quickly became an obstacle for both teams. It would stay that way for much of the contest. The biggest difference in the game occurred in the fifth inning when with one out, Lars Nootbaar dropped a fly ball off the bat of Muckdogs’ Brayan Hernandez in left field. Then just a few pitches later, Spikes’ first baseman Brady Whalen dropped third baseman Stanley Espinal’s throw. Espinal made a nice back-handed play on a ball hit towards the third base line by Demetrius Sims. Had the play been made, starting pitcher Franyel Casadilla would have had to work with a runner at second with two outs. Instead, the error allowed Hernandez to advance to third and put runners on the corner and took Casadilla out of the game. Spikes’ manager Joe Kruzel went to his bullpen in favor of Will Changarotty. Casadilla (1-1) — a late switch for starter — hadn’t started a game since June 20th. Between then and Wednesday, he had not thrown more than 50 pitches in an outing. He did what he could, though, in his 4 1/3 innings of work. He allowed four runs — two earned — off five hits. He also had three strikeouts with no walks on 79 pitches — 51 of them for strikes. “You have to give him a lot of credit,” Kruzel said. “… We told him last night that he was going to start after (Jake) Dahlberg went up to Peoria … For a young man to go out and then after the 2 hour and 20 minute delay at the beginning of the game; to go out there and do what he did to give us an opportunity, you gotta really pat him on the back and thank him for what he did. He got a lot of outs on the pitches that he used. He was stuck with having the loss attached with his outing. After shortstop Delvin Perez had a tough time coming up with a groundball hit by Jerar Encarnacion with one out in the eighth, J.D. Osborne hit a double to the deepest part of the park in left-center field. The ball one hopped off the fence and scored Encarnacion rather easily. That ended up being the game-winning run for the Muckdogs as the Spikes put together an attempt for a comeback with their final out. Alexis Wilson singled with two outs in the frame before turning the lineup over to leadoff man Nick Dunn. With Elkin Alcala looking for the save, Dunn made things a little more interesting when turning on a 1-1 pitch and hitting it well into the metal bleachers in right field to close the deficit to one. “It was one of those situations where we came to life there a little bit in the ninth with Dunn’s two-run homer, but it was too little, too late,” Kruzel said. Dunn went 2-for-5 and drove in three runs for State College. 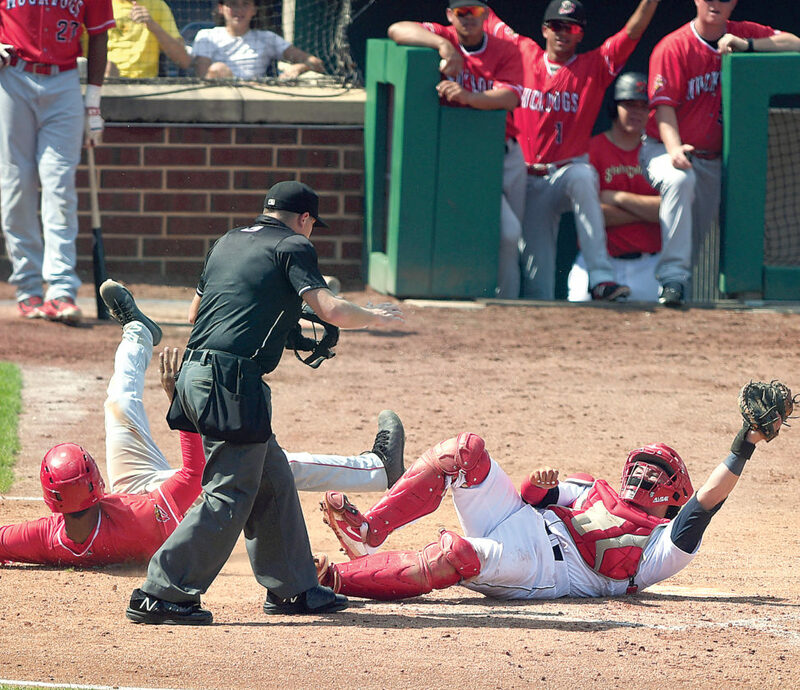 His other RBI chance happened in the seventh when he too was given a second chance after Muckdogs’ catcher Igor Baez dropped a pop up in foul territory to keep the at-bat alive. Dunn went the other way to left for the single to score Brady Whalen. Whalen, too, had an impressive day at the plate for the Spikes with a 2-for-3 performance. The switch-hitting Whalen provided State College’s first run of the game, hitting the ball on a rope to right field for a solo home run. It was apparent early that the ball was going to have some carry with it as with two outs in the opening frame, Batavia’s Sean Reynolds went the other way on a full-count pitch. The ball looked as if it were going to stay in play, but just kept carrying beyond the left field fence for the game’s first run. Reynolds was one of three Muckdogs to have a multi-hit game joining Encarnacion and Donadio. All three went 2-for-4 in the contest. Despite the tough breaks, Kruzel is pleased with what he saw from the three pitchers — Casadilla, Changarotty and Troy Montemayor — sent to the mound. The Spikes left seven runners on base with three of them in scoring position. Tyler Kolek (1-1) pitched three innings of relief for the Muckdogs and picked up his first win of the season. He allowed one unearned run on a hit and two walks. He struck out one batter while reaching mid-90s with his fastball.